ShuffledHashJoinExec is a binary physical operator to execute a shuffled hash join. 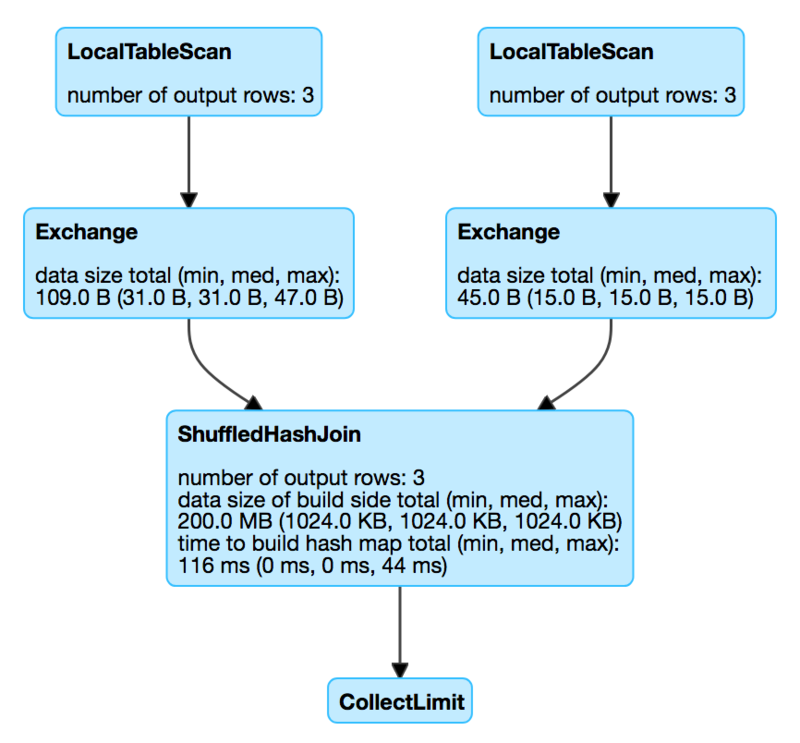 ShuffledHashJoinExec performs a hash join of two child relations by first shuffling the data using the join keys. ShuffledHashJoinExec is selected to represent a Join logical operator when JoinSelection execution planning strategy is executed and spark.sql.join.preferSortMergeJoin configuration property is off. In other words, you will hardly see shuffled hash joins in your structured queries unless you turn spark.sql.join.preferSortMergeJoin on. // How is that possible? // BINGO! ShuffledHashJoin is here! doExecute requests streamedPlan physical operator to execute (and generate a RDD[InternalRow]). doExecute requests buildPlan physical operator to execute (and generate a RDD[InternalRow]). doExecute requests streamedPlan physical operator’s RDD[InternalRow] to zip partition-wise with buildPlan physical operator’s RDD[InternalRow] (using RDD.zipPartitions method with preservesPartitioning flag disabled). doExecute generates a ZippedPartitionsRDD2 that you can see in a RDD lineage. doExecute uses RDD.zipPartitions with a function applied to zipped partitions that takes two iterators of rows from the partitions of streamedPlan and buildPlan. For every partition (and pairs of rows from the RDD), the function buildHashedRelation on the partition of buildPlan and join the streamedPlan partition iterator, the HashedRelation, numOutputRows and avgHashProbe SQL metrics. buildHashedRelation creates a HashedRelation (for the input iter iterator of InternalRows, buildKeys and the current TaskMemoryManager). buildHashedRelation uses TaskContext.get() to access the current TaskContext that in turn is used to access the TaskMemoryManager. buildHashedRelation records the time to create the HashedRelation as buildTime. buildHashedRelation requests the HashedRelation for estimatedSize that is recorded as buildDataSize. buildHashedRelation is used exclusively when ShuffledHashJoinExec is requested to execute (when streamedPlan and buildPlan physical operators are executed and their RDDs zipped partition-wise using RDD.zipPartitions method).